I love beans of every variety! Green, garbanzo, pinto, kidney, lima...you name em, I love em. When I was a little girl, my mom would buy these cans of big, white lima beans that had little chunks of ham. I loved those, but haven't seen them on the shelves in years. Another childhood favorite of mine is Campbell's Bean with Bacon soup. Yum! Recently, I found some Rancho Gordo Flageoulet beans at the Farmer's Market and decided I'd make a nice Cassoulet on a chilly Winter night. 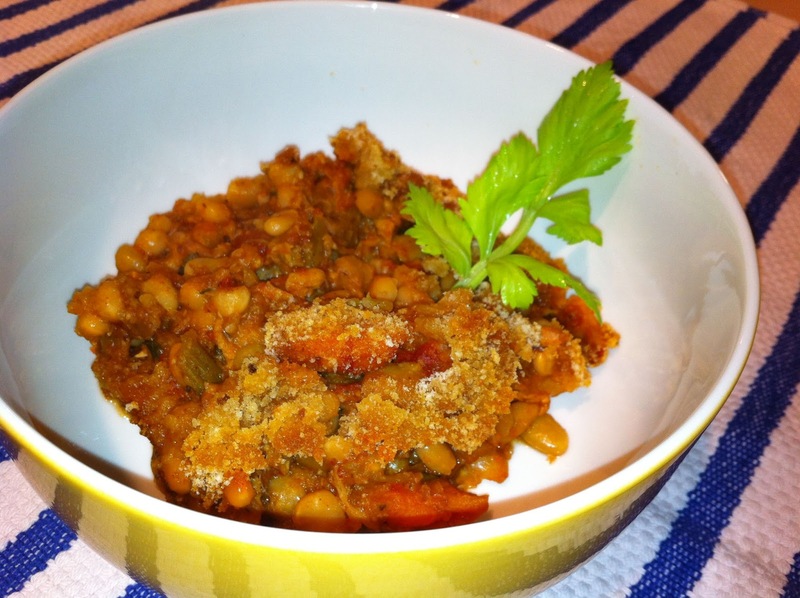 This delicious Cassoulet reminds me of sort of a cross between those two canned childhood favorites...but with a more grown-up twist. You really should use dried beans, preferably Rancho Gordo...I love those beans! You can also use whatever kind of meat you want. I prefer a selection of pork, but you could use chicken or even duck legs, if you want (but be sure to drain all the fat from the duck cuz thats just too greasy). FYI, you will need to soak your beans overnight or do a quick soak in the morning (4-6 hours). When you are ready to begin the Cassoulet, preheat the oven to 400. Cook the bacon in a large sauce pan or Dutch Oven until crispy, set aside. Brown the Canadian Bacon, set aside. Brown the sausages on all sides. I do the pork in separate batches so they brown evenly, but you could throw it all in together if you want. Drain the oil out of the pan. Put all meat back into the pan. Add the veggies and herbs to the pot, give it a stir and let them cook until softened, about 10 minutes. Spread the panko bread crumbs over the top of the Cassoulet then dot with butter. Put the uncovered pot back into the oven for about 15 minutes until its nice and golden. *I like to be flexible with my ingredients. There are no rules that say you HAVE to use every ingredient exactly to the letter. If you don't like celery, use bell pepper...or omit it. If you don't like sage, use parsley! You could use chicken broth instead of water, if you want. Get the idea? :) Just be flexible and have fun. Melt the butter in a large sauce pan. Add the diced onions and saute until translucent, about 5 minutes. Sprinkle the flour in, give it stir to make a roux, and cook for about a minute or two to get the floury taste out. Slowly pour in the milk (you can use 3 cups of whatever kind of milk or cream combo that you want), bring to a low simmer. Add the broccoli florets and the spices. Bring back to a simmer. Cover and simmer on low heat for about 20 minutes. 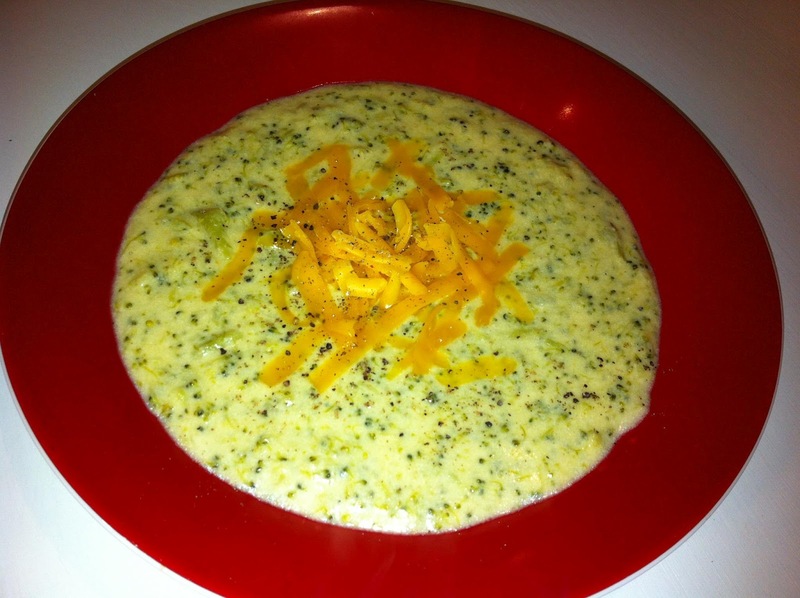 Add 1 cup of the cheese and stir until it melts. Add the remaining cheese as garnish. Enjoy! This was super duper delicious soup! 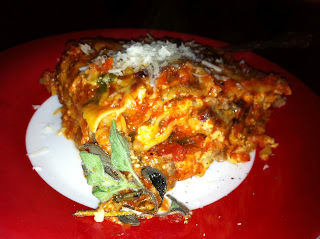 Seriously the best Lasagne I've ever made! I've been making Lasagne since I was a teenager and my friends and family have always complimented me on how well I make it. A good Lasagne is all about the sauce. A good sauce is all about the fresh herbs. 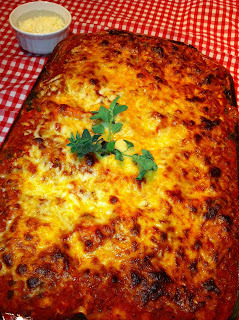 This Lasagne has mild Italian sausage & spinach. It was so good. Recipe happily available upon request. I had a very nice Valentines Day! Dinner was just "ok". We are out of propane, so I had to broil the pork chops and I just couldn't get a good color on them. The cake turned out really pretty; I put a heart made of raspberries on top. My husband brought me a bouquet of Sunflowers AND a bouquet of red roses! Love them! Also, a really cute card with an adorable Pug face, and a hot pink running top and black running capris with hot pink trim. Love them! He also got me a small heart shaped box of See's candies....which is weird because I told him in the very beginning not to get me chocolate for Valentines Day.....and he never has until this year. And this is what? Our 25th Valentines Day together? lol Maybe he wanted it for himself! I got him a HUGE pink See's heart, truffles, chocolate, chocolate, & more chocolate, so he doesn't need it. Today I have a ton of housework to do, then I will start the sauce for the lasagne tonight. My family is spoiled; they don't want Ragu, they have to have MY homemade sauce. I can't say I blame them. ;) I do make a good sauce. I'll post my recipe and picture one of these days for all my readers! lol I know I have a lot of work to do on my blog, but I figure the first order of business is to just write. I am behind on many recipes! I have the pics, but I need to upload them to my computer and write out the recipes. Well, time to get productive! I love Valentines Day! Its just fun, no obligations, just remember those that I love. I like to get gifts for my family and spoil them on this holiday. I mailed a Valentines Day care package to my daughter, who is away at college. I also sent her a bouquet of flowers, but I don't know if she got it yet. I got flowers for my 14 year old daughter and for my husband. Lots of chocolate, too. We celebrated Valentines Day in Napa over the weekend, so we are staying in and I'm cooking pork chops, scalloped potatoes, Caprese salad, & chocolate cake with chocolate frosting & raspberries. I don't like chocolate cake with raspberries, so I won't be tempted, but my family will be in heaven! I am sure we will open a bottle of bubbly, too!